I have read a few books by Katie Fforde and have always found them light and enjoyable reads. 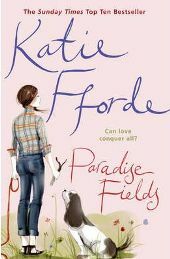 ‘Paradise Fields‘ was no exception and was just the right book to wind down with over Christmas! The story centres on Nel, a fairly young widow with three teenage children. She has a busy life involved with many things in her village, not least her attempts to set up a local farmers market and her fundraising for the local children’s hospice. She even has a little love interest in the form of Simon, a local estate agent (say no more!) who in the eyes of her children is predictable, dull and bossy, even if he is useful around the house. So all is well in the village until certain events occur that could threaten Nel’s blissful existence. The hospice is threatened when a local landowner decides to build on land that the hospice has always used for events and access – and – at the same time, Nel meets Jake, a very attractive if slightly younger solicitor, who has to compare quite favourably to Simon. However, and in order to make more of a story of it, things are never as uncomplicated as they should be. Jake only happens to be the solicitor who is acting for the landowner, and therefore Nel finds herself at war against him. As the story unfolds, the reader is drawn into Nel’s valiant attempts to save the hospice, and her ever confusing relationship with Jake. And what of Simon watching from the sides – is he the good guy to be pitied, or maybe not quite what it seems? All is revealed as the book moves steadily towards its conclusion of which I will say no more! Overall, this is a nice gentle read. Things do progress steadily and I certainly found myself drawn into the story, but if you like all action and adventure this book is not for you! No Comments on "Paradise Fields"